MAN Sports brings you L-Carnitine 1500, a new way to help you burn fat! In liquid form, it will mix smoothly with water or your beverage of choice. This supplement is stimulant free, making it a perfect addition to any supplement stack. L-Carnitine is an amino acid that helps convert fatty acids into fuel for your muscles, promoting weight loss and the growth of lean muscle mass. With its delicious flavors, you can enjoy your supplement! 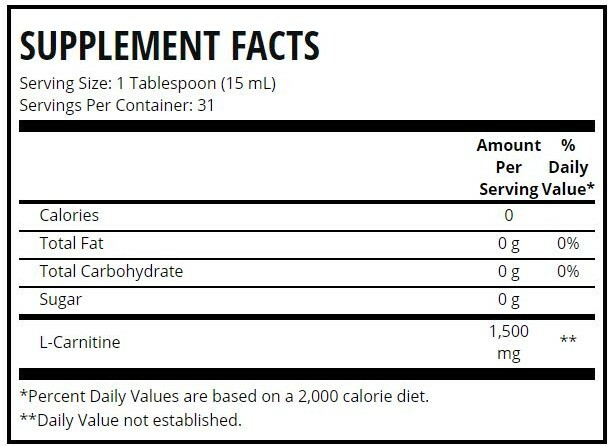 As a dietary supplement, consume one tablespoon of L-Carnitine twice daily or as directed by a physician or licensed nutritionist. You may also mix with your favorite juice or beverage. REFRIGERATE AFTER OPENING. Allergen Warning: This product is manufactured with equipment that process products that may contain milk, egg, soy, tree nuts, peanuts, wheat, fish, crustaceans, & shellfish. Store at room temperature up to 70• F (21•C). Do not store directly in sunlight. Keep enclosure tight at all times.